If you don’t have your own photos or illustrations to share during the #VisibleWikiWomen campaign, you can search online and find images to upload, for use on Wikipedia. Ready to search? The most important thing to know: a simple Google search to find images of women is not enough. Most often, the results of a Google image search are copyrighted images which are not shared under a free and open license. Those images shouldn’t be uploaded to Wikipedia because only freely and openly licensed images are allowed in the world’s largest encyclopedia. If you are trying to find images for a notable woman’s biography, be sure that the image you are considering is as free and open as Wikipedia itself. Many individuals, cultural institutions and media organizations use free and open licenses to share their creative work, such as images and illustrations, to allow anyone to use their work for different purposes. Wikimedia Commons, which is the media repository for Wikipedia, only allows creative work that can be freely and openly shared, using licenses by the Creative Commons community. Use in commercial as well as educational and non-profit contexts. The first two kinds of licences also require anyone re-using this image to acknowledge and reference the creator’s original work, also known as attribution. Here’s an example of an image shared on Europeana by the Sörmlands museum under a free and open license (Creative Commons Attribution-ShareAlike), which can be uploaded onto Wikipedia. if the copyright has expired because many years have passed since the image was created. Each country has its own copyright laws. The way to keep it simple is to remember that the copyright rules of the United States apply to Wikimedia Commons. So, the image you want to upload to Wikipedia must be out of copyright in the United States. The photo was published for the first time in the United States before 1923. The photo was published for the first time outside the United States before 1923, and the creator died more than 70 years ago. The reproduction of a painting that was created by an artist who died more than 70 years ago. Remember to make it clear that the image you are uploading is in the public domain by mentioning the source (where that image can be found) and the creator (the person who created the image). You will need the source and creator’s information to complete your upload, so try to gather all this information before you start uploading! If you’re still confused or unsure about a particular image, please email us at visiblewikiwomen(at)whoseknowledge(dot)org. We will be glad to help! Remember to check if the image you want to use is shared under an open license in the website you are doing your search. Use the advanced search option that is usually available in most websites. The advanced search allows you to refine your search and apply filter such as type of media, date, license, etc. On Flickr, Internet Archive and CC Search, you can filter by license. On Google Images you can filter your search by usage rights. 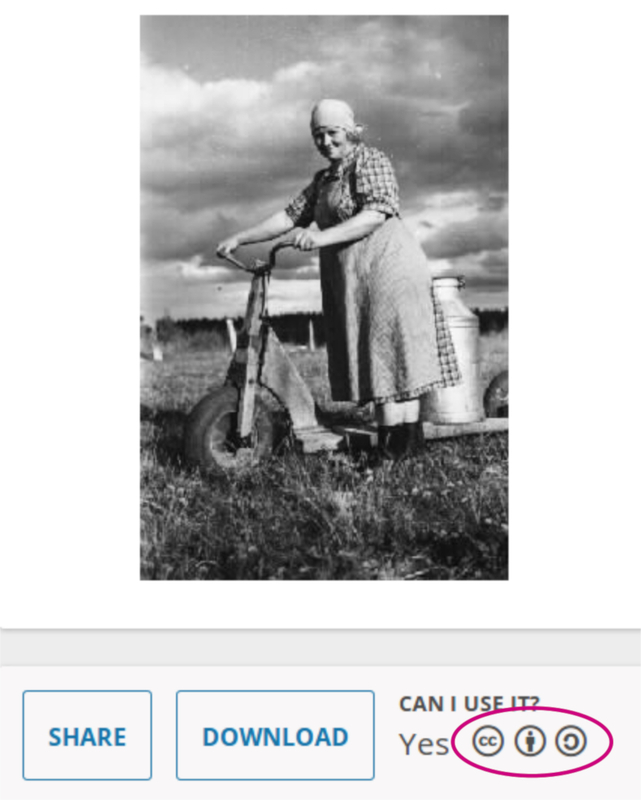 Click on Tools – Usage rights and choose Labeled for reuse with modifications. Search locally: visit the websites of museums, libraries and archives of countries or cities that could have free and open images. Here is a list of some websites you can search for images with free and open licenses. These websites also o en share informa on about the date and creator that will allow you to check if the image is under public domain. Thank you for improving Wikipedia by searching for and adding these images!